Last night, I after running through another Horseman dungeon and still not getting the mount drop, I decided to queue up for random Siege of Orgrimmar LFR. Love the new option where you can keep queuing for multiple LFR options (select -> join queue, select new -> join queue). I join all 4 Siege raids and see which one pops first (usually another run at General Nazgrim with the wipe debuff). Anyway, Tuesday, I drop into Gates of Retribution on Elk and after waiting 15 minutes for a second tank, we finally start the fight with Galakras. 12:15am hits, and BAM! Internets drop. 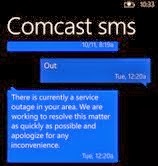 Send a SMS msg to Comcast (266278) and it's confirmed. Down. :( Guess it really is time to go to bed. Took Wednesday off, (daughter needed homework help), so last night try again. This time, Elk get's his run (of course LFR shoulders drop off Nazgrim), so I hop over to my Disc Priest. Nothing off Nazgrim, but when we get to Gates it's 12:00am. Yep right around 12:15, my Internets drop again. This time Comcast doesn't know of an outage. Router is in my bedroom, so power cycling it while wife sleeps is frowned upon.